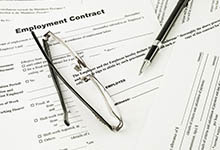 Employment law encompasses a number of issues and situations in Massachusetts. There may be a lot riding on your employment law case. It can affect your paycheck, your reputation, your benefits, and if you are a business owner, it can greatly affect the success or future of that business. The law firm of George C. Malonis works closely with clients to handle any and all employment law issues with confidence and a tireless dedication to righting any wrong that has been done. There can also be the need for sensitivity and compassion related to an employment law case. George C. Malonis is the source for the compassion you may need and also the aggressiveness your case may require. There are many employment law situations that can be particularly difficult to prove or defend against. Cases involving sexual discrimination and wrongful termination can be especially difficult, extremely stressful and personally traumatizing. While George C. Malonis is known as an aggressive asset in the corner of his clients, you can also count on compassionate representation so you can focus on getting past the experience. George C. Malonis will focus on getting the settlement, job reinstatement, or the resolution you want and need. When you feel you are in the right or you have been accused of a wrong that you did not do, the law firm of George C. Malonis will devote the time needed to prove your case, clear your name, and protect your rights. When it comes to employment law disputes between an employer and an employee, there may the need to gather evidence of a wrongdoing, interview witnesses, gather of documents, or other actions that need to be handled in order to prove a certain position or case. The process of resolving an employment law issue can be time-consuming and overwhelming for the person affected, whether it is the employer or employee and their families. George C. Malonis is an experienced Massachusetts employment lawyer who will analyze the details of your case, then devise a strategic plan that will help prove your case, defend your position, or otherwise help you get the best possible resolution. With a dedication to excellence, fairness, and justice, George C. Malonis always works diligently to protect the rights of clients and ensure the law is upheld every step of the way.